Today is George Frideric Handel's birthday. 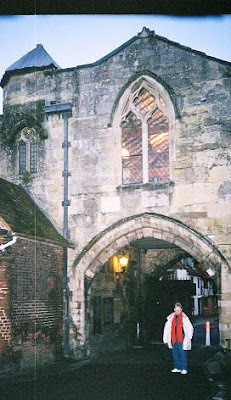 My mother and I visited England in November, 2004 - her first trip there. Among the many churches we visited, one stands out although I can't remember the name of it! We were told by our guide that we were standing beneath the room in which Handel gave recitals - and possibly part of the Messiah. We were extra excited! My mother manages to sing in a community choir that performs the Messiah each year - or at least the Hallelujah Chorus. When I was a teenager, I remember performing the entire Messiah with our church choir. Over the years, I've been in other church choirs that have performed it. There is nothing so glorious! Many years later, in my first full year of opera going, I built my Met subscription around Handel's Rodelinda so I could finally see Renée Fleming in an opera. My friend Paul, my subscription partner, called it "Boredelinda". But I was so excited! My favorite parts of the evening were when she slipped off her wrist shackle herself. Then when she gestured grandly on a top note and her ring flew off, bounced across the stage and fell in the orchestra pit, it was all I could do to keep from laughing. Then finally, when everybody is reunited and living a happy ending, Stephanie Blythe almost stole the show as she sidled cross the great set to claim her man. It was all so fabulous! And the music! Oh! I saw Rodelinda again several times and while Handel's operas are not quite as thrilling as the Messiah (yes, I fell asleep at Handel's Giulio Cesare in Egitto at the Theatre du Champs-Elysees in October, 2006), I still enjoy them immensely. By the way, my favorite of Renée's albums is Handel Arias. It simply makes me happy.